History : 06/09/99 : Acquried for free. 02/26/00 : Picked up some doc, software, spare calculator style keyboard, face plate and some chips all for free. This just arrived. 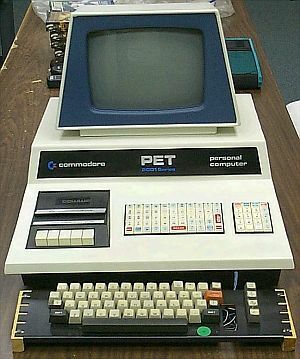 It is the original PET 2001 with the calculator style keyboard and the internal cassette deck next to the keyboard. The original owner added an external regular keyboard. If you have anything related to this or other PET models to pass along, drop me an email. In the meantime, check out this old review from Creative Computing.